Unfortunately, many workplaces today are characterized primarily by complaining, sarcasm, and an overall negativity. This leads to poor morale and increased frustration among employees and managers – and results in higher staff turnover and numerous negative behaviors. Fortunately, there are practical steps that can be taken to create a more positive work environment. Learning how to communicate authentic appreciation to colleagues (rather than “go through the motions” employee recognition) can make a huge difference – as attested by our clients (Microsoft, Miller Coors, Million Dollar Round Table, numerous hospitals and over 250 colleges). This fast-paced, high-energy humorous presentation will encourage you and give you the tools and resources to make a difference in your workplace. Irritation is growing among managers, supervisors and employees: Millennials. Gen Xers. Boomers. All are frustrated in trying to understand and work with those from different generations. Why? What are the real issues? Three issues underlie most of the conflict: not feeling respected, lack of trust, differing views of what comprises a “good work ethic”. Dr. White explores the underlying dynamics of the intergenerational tension, where they come from, and outlines practical steps to address them. Virtually every organization is facing the challenge of having to make numerous changes – due to advances in technology;changes in laws, rules and regulations; shifts in the marketplace with customers, vendors and competitors. At times, the amount of change managers, supervisors and employees experience feels overwhelming. Unfortunately, most people’s reaction to “change” is negative – complaining, defending, resisting. Fortunately, however, when employees have a foundation of feeling truly valued and appreciated for who they are and their contributions, their resistance to change diminishes. Learn how to communicate authentic appreciation to your team members and help the process of dealing with change go more smoothly and positively. Virtually every leader and employee would like their workplace to become more positive, healthy and successful. But how does this happen? Dr. White, in his work with hundreds of organizations has identified the most common obstacles to becoming a vibrant workplace – where work gets done effectively and people enjoy their work. Discover what a “vibrant workplace” looks like practically, the most frequent challenges experienced is developing a positive work environment and the practical steps that each person (regardless of their position) can take to help their organization become a healthier, more energetic place to work! How to Deal with Toxic Leaders and Dysfunctional Colleagues. Toxic workplaces. Bully bosses. Dysfunctional colleagues. People hating their jobs. All of these issues are constantly in the news. The sad reality many supervisors, managers and employees have to deal with the challenges (and pain) of working with extremely difficult co-workers. 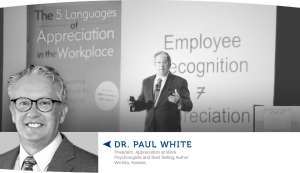 From his research with thousands of employees, Dr. White identifies the core components which create an unhealthy work environment, and explores the dynamics underlying toxic leaders and dysfunctional colleagues. More importantly, he provides practical steps for individuals to survive a negative workplace and survive dealing with emotionally damaging colleagues. “Change” is a regular part of our everyday lives – both professionally and personally. In fact, the amount of change we experience often feels overwhelming. Having the tools to respond and adapt in healthy ways allows us to enjoy our lives more and experience more success in our daily life responsibilities. In this presentation, Dr. White will help participants: a) discover why people usually respond negatively to change; b) develop ways to react more positively to changes in their lives; c) learn and remember practical tools to successfully manage change; d) apply the concepts and resources back in their daily work settings, both immediately and in the coming months.